Regis Debray’s biography is quite colorful and is connected to Marxism and political activism, to McLuhan and to pedagogical media theory. Debray, Régis. Transmitting Culture. Columbia University Press, 2004. A short text on Debray’s Mediology by Lauri Heikonen, ePedagogy Design student. One prominent idea of Debray which has influenced pedagogical media theory as seen by Torsten Meyer is the distinction between communication (spatial dissemination/presentation of information) and transmission (cultural or institutional perpetuance of information). As an example, this eMail to you is communication; but the interpretation of it is depending on transmission, i.e. concepts within the institutional framing of university/institutions of learning & teaching. Is your interest in stereoscopy restricted to recorded/replayed linear content (= e.g. movies), or does it also include 3D rendered scenes and processes, where the viewpoint may be controlled by the user in real time (= e.g. simulations, games)? Connecting Pedagogical Media Theory approach to a supposed widespread stereoscopic media usage. What may be its educational-aesthetic-cultural impact? Supplementing your MA thesis with interesting addendums, different views, side glances. I think this is an important aspect: You should somehow be able to use ideas and texts developed in this course in your MA thesis or your general work. I’m no expert in the field of 3D visuals, too; but I believe that there is much to be expected in future aesthetic, didactic, and cultural impact from 3D as medial extension. As you stated, 3D has a long tradition with several attempts during the last hundred years to establish it as regular technical and artistic medium. Sight is our primary esthesia, and dominant in our visually oriented global culture; resolution, framerate, color depth and 3D-rendering both in recording/design and playback/interaction have advanced greatly, with a market hungry for innovation in further modes of visualisation. First of all I must state that I am by no means an expert in the field of 3D, but merely strongly interested in that realm and trying to learn about it as much as I can. So at the moment I see myself as an student of stereoscopic world and its possibilities. Nevertheless, I can make an effort to try to connect the concepts of McLoud and McLuhan to my current knowledge and thoughts on the subject matter. But first, I think I have to address the issues of the history of stereoscopy and my personal views on the 3D sphere, in order to give grounds to my commentary later on. So if it is ok, I would like to concentrate on the basics in this first post and then later on answer the more specific questions about 3D -visuals presented in Shaping Media blog. In his book A History and Filmography of Stereoscopic Cinema R.M. Hayes notes that there is no consensus on an exact historical point in time when stereoscopy was born. According to Hayes, most scholars consider the greek physician Galen, who lived in the second century A.D., the first to address these issues in his writings. Others, however, argue that so few original texts have survived from those days that it is not possible to say how broad the knowledge of stereoscopic principles was in the ancient world. Usually stereoscopy, as a science and a cultural form, is seen to have originated with the mirror apparat built by Sir Charles Wheatstone in 1833. Like many of the greatest inventions, the thing that Wheatstone had recognized is so simple, that it might even seem obvious. It is generally known, that most human beings have two eyes, which, despite their common point of focus, receive their image of the surrounding world from a slightly different angles. So the right eye sees a bit more of the right side of the object in the field of view and the left eye sees a bit more of the left side of the same object. Instead of these two images being interceded to the mind as two separate and individual pieces, the brain combines these images into one image, in which the differing information of the two viewpoints appears as a sense of depth. In nature this kind of binocular vision is common to predators at the top of the food chain, whose success depends on spatial perception and the ability to accurately evaluate the position of the pray. I believe, that the stereoscopic format is a natural way for human beings to receive visual information, and this is true regardless of the fact, that two dimensional surfaces have been dominant in the field of audiovisual representations for ages. I do admit, that it is justified to ask how can stereoscopic dimensions enhance an audiovisual experience – especially since audiences do not usually question the lack of depth of plain surfaces that are commonly used to display imagery. But throughout the history of development of transferring information using man made images, there has been a distinctive tendency to strive towards mimicking our natural way of perceiving our surroundings with the aid of technology – movement, color and resolution are clear examples. And I think that stereoscopy is a natural extension of this development. When sound was first introduced to cinema, the most prominent critics mocked the development and made remarks like “if I want to hear actors talk I go see a play or open a radio.” Color was met with similar disdain, and labeled as unartistic quality that would ruin cinema. Yet in both cases, there was more information provided to the receiver and despite the judgement of the critics the audiences demanded sound and color as soon as they were available. So far the stereoscopic technology has been ridiculed by critics using the same kind of arguments heard in the past, but it has not yet proved them wrong in the manner of sound and color. Stereoscopic technology has had three major attempts at gaining hegemony in the visual culture – one in the 1920’s and two follow ups in the 50’s and 80’s. All of them were plagued by major technological and financial problems, which at the time were difficult to overcome. And now, at the beginning of a new millennium, the audiovisual industry is pushing once more for the acceptance of stereoscopy into the mainstream. At the moment the success of this fourth major attempt is somewhat questionable. Yes, a major portion of the products from the Hollywood pipeline are stereoscopic, but the 3D TV channels have been a failure. Of course the history and the bad reputation gained over a century is hard to overcome. But in addition to fighting prejudice from critics and audiences alike, there are still practical conventions that the users find dissatisfying – the most noticeably the glasses. The hardware producers have used famous designers and fashion brands to design aesthetically pleasing models of 3D glasses, but to me (and perhaps to the buying audiences) this looks like a desperate attempt to cover up impractical solutions by directing the attention to superficial qualities. I believe, that in order to become a household name in all visual communication, the technology most likely has to be autostereoscopic, meaning 3D without any glasses or other supplements. But the first time in the history of stereoscopic culture there is light at the end of the tunnel. The advent of the digital technology has made it possible to address the issues that formerly were next to impossible to overcome. These challenges were noticeable in every part of the production process, all the way from initial planning to projections in theaters (the latter being perhaps the most difficult one and the one that made most damage to the reputation of stereoscopy during the past decades). And although were not there yet, we can see the development being made with the autostereoscopic technology. It might start with small apparatus such as the likes of Nintendo 3ds instead of the big screen, but it is happening. And when that is combined with the currently existing possibility for individual people to affordably create their own (and high quality) 3D content, there will be a change for stereoscopic culture to gain more ground in the world of visual communication and perhaps even become a dominant convention to represent visual information. Welcome to “Shaping Media”, Larisa and Raine. A medium is not restricted to being a technical device, like a radio, a newspaper or a browser. Any conceptual space that enables us to identify, interpret and generate signs in a specific, meaningful manner can be seen as a medium. “Speech”, “text”, “hypertext/multimedia” are examples; cultural concepts like “School”, “Therapy”, “Art” or “Journalism” may be also conceptual media, changing over time and culture in their definition and possibilities. We cannot communicate outside, or without a medium. (I will never be able to think exactly what you think, there will always be technical and conceptual media between and around us). A medium enables us to interpret phenomena within it as meaningful and dismiss phenomena outside of it as contextually meaningless, or as having a different level of meaning. (a bag of popcorn seen dropping down in a movie has another level of meaning as a bag of popcorn dropping in the cinema, in the seat near you – in the context of the movie). A medium allows for specific forms in it to be generated, and inhibits the generation of others. 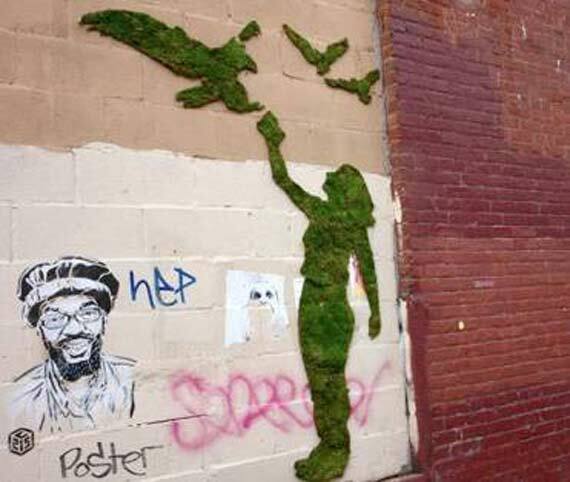 If a medium works well, over time we will not be aware anymore of its workings, it will become our ‘second nature’. Noora asked about my opinion on how to arrange an exhibition for her project. I’ve never arranged an exhibition – but from my point of view (as was the topic of the seminar), an exhibition is a pedagogical medium: You have to deal with concrete restrictions of space, time, architecture, technics, location; you’ve got expectations from visitors on how an exhibition should work; and you have an intention, an idea you want to express via this exhibition, within the limits and possibilities of the medium “exhibition”, one that triggers a response from your audience. So, what and how do you want to express with the exhibition itself, so that it resonates and references what you want to express with your foto series (Marshall McLuhan)? You could see the exhibition as a kind of painting, with your pictures as colors; or as a novel with your pictures as paragraphs; as a comic where your pictures are the panels, and the magic happens between the pictures (Scott McLoud). These are, of course, different aesthetic media as analogies for how you could see and arrange your exhibition: linear and telling a story; holistic and painting a picture; maybe just delivering one half of what can be told and challenging the visitor to fill in the other half; and maybe even challenge that, the personally filled-in-half, after the visitor expresses it (Heinz von Foerster, Niklas Luhmann): An exhibition trying to turn an individual or cultural construction visible as such. I talked with Noora about the conditions of art, intercultural/multicultural understanding, and her project of photography of empowerment. 2.) and a free space for the user/viewer/learner to apply “closure” on (see McCloud), to fill the gap between the context markers by one’s own interpretation. 3.) Something that motivates the user/viewer/learner to fill the gap, some incentive for him or her to change a well-known viewpoint and follow the course into uncharted cognitive territory. Artists, therapists or educators each have a specific advantage touching this element: Aesthetics in art (“I want to experience”), psychological strain for therapists (“I want to change”) or curiosity for educators (“I want to know”). A video clip was produced by an ad agency for about 100.000 Euros. This clip was meant to raise interest in the age group of 9-13 year old females. It worked exceptionally well as a viral campaign on what context markers not to use to create the context “Women as sciencists”. Again: Two approaches to initiate education, one obvious to inform and integrate; and one to question invisible medio-cultural givens. “Closure” is a cognitive prerequisite for reading comics, as explained by Scott McCloud – but this holds also true for all media and the cultural medium. It may be also valuable for your project approaches, for the ‘space of (re)action’ you try to construct for your passersbys, pupils or family members to (re)act in, where they are free to generate new meaning. Foerster’s “Blind Spot”: Obviously we do not see that there are blind spots. The neurophysiological blind spot in our field of vision gets ‘stitched shut’ by our brain, so we have no gaps in our world(view). Generating continuity where there is none is an effect of closure. Bateson’s “Context and context markers”: No situation is exactly as any one we encountered before. We need generalized context markers that let us decide upon a current context in a situation. A ‘room’ with ‘rows’ of ‘tables’ and ‘seats’, all ‘aligned’ and ‘directed towards’ a kind of ‘presentational medium’ – and we ‘see’ a classroom-context, with closure smoothing over anything that is situational or does not exactly fit into this picture. Arts and media: See the examples below by Rene Magritte and Scott McCloud. Education and didactics: By softening, recontextualising or sabotaging context markers, we may become aware of them as cognitive constructs: generating a big, continous picture will then turn into a willing, conscious act of (inventive) closure (McCloud may call this “Non-Sequitur”; though there may be a medial step-up). The awareness may be a temporary dip into a higher type of learning. “(…) Sometimes a problem seems difficult or insoluble because our assumptions about it are wrong. A classic example: A father and his son are involved in a car accident, as a result of which the son is rushed to hospital for emergency surgery. The surgeon looks at him and says “I can’t operate on him, he’s my son”. Explain. Try this story with kindergarten-teacher, a dancer, or a hairdresser and see if the results are the same (this kind of deceptive gender stereotyping can also be measured by an implicit association test). Do you have a mental image in your mind after reading this text? This is the helpful, but also sometimes restricting effect of closure. 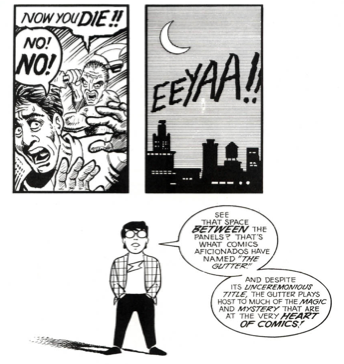 One of the best books (or medium) to explain comics, is Scott McCloud’s comic “Understanding Comcis”. The title is a hommage to McLuhan’s “Understanding Media”, written three decades before. McCloud not only explains comics, but also aspects inherent to all media and human cognition, aspects like closure or amplification by simplification. Famous game designers like Chris Crawford and Will Wright (“The Sims”) recommend McCloud’s comic. How come? With other words: The artist, educator, therapist creates the demarkation for a nearly ’empty’ medial space – for you to fill with individual meaning! Creating a space for you! If we talk, there’s magic happening. A sequence of sounds – or letters – become words, and evoke meaning. By saying “egg”, “huevo”, “Muna” or “Ei”, a concept of a white, ovoid form comes to our minds, without there being a necessary connection between the sequence of sounds and its denotation. Where is this connection coming from? 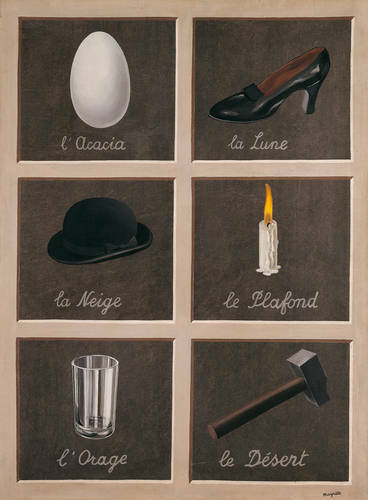 René Magritte (1930): “The Key to Dreams”. “See that space between the panels?” – What about the space between words and images, between the lines of the image, or between the words? Do you see these spaces? That, what you do not see, is a medium at work: Creating a space for you. Transfering ideas to a medium, or even a try to represent reality in a medium, requires the artist, edcuator, propagandist to leave out a medium-specific ‘gutter’, where the reader, viewer or learner fill in the gap (e.g. words in a text are not ‘connected’; a camera never shows the place behind the objective; a painting ‘stops’ at its frame). “You do not see what you do not see.” (Heinz von Foerster) – This is the power of a medium, and the responsibility of an educator, designer or artist: working with and within a blind spot of medial reception, for the learner to discover, and play with. What is “closure” (McCloud 1993, “Chapter Three. Blood in the Gutter”)? There seem to be different kinds of closure, based on the physiological limits of our senses to the limits of our (culturally affected) cognition. Can this phenomenon of medium design and medium usage be found in other media as well? How can closure be used in learning/teaching? I think Kaie is right there, there will always be something that may amaze us in our world, even for teenagers, adults or aged; with our fellow men being reliable triggers for amazement. 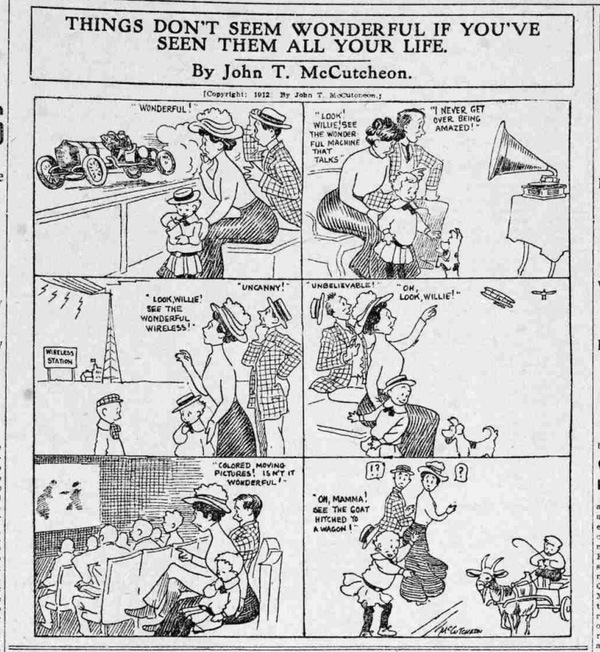 Above left: Cartoon by John T. McClutcheon (1912); between wonderment and stun on new media and means of transportation. Above right: Panel from Carl Barks (1950), “Rip van Donald”, in Donald Ault (2003) “Visionary Synchronicities in Carl Barks Comics.” Comic Art 4 (2003): 44–58; fearful and threatening visions of the future (though ether induced). early 15c., “stupefactive;” 1590s, “dreadful;” prp. adjective from amaze. Sense of “wonderful” is recorded from 1704. Related: Amazingly. Some thoughts that came to my mind, when reading Wey´s posts and Bateson´s text about learning as the changing of choice(s) one is able to make. This is a very good point! In fact, I´ve always thought that the expression doesn’t ´t always have to be interpretable as long as I see that it comes from the heart, or I can feel that the artist is not lying. (How can you tell that is another topic.) When I was teaching young children at art studio, usually after the course parents came and asked what is this picture or sculpture or “thing” that their child has done…And I didn´t know always because I didn´t want to ask their child:) (Usually, when they wanted to tell me, they came and told me voluntarily.) Then I made up something to say to their parent, because I had a feeling that if I don´t know, I would be a teacher “who doesn´t care”. Or there is this other fear, when parent sees that his/her child is using, lets say, too much black color, their cild has immediately something wrong. But it is not so simple – maybe their child likes night a lot:) But usually parents assumed something negative. Very stereotypical – black color=death…? In my opinion this is an early approach how to interact with a plant…And I think it shows very well how we estimate the plants intelligence…or how we try to force our “knowledge” to others thinking that they deserve it. Opening the Belief Window – The Process and Templates – Part 2 | THOUGHTstream Tools on April 4th: Blind spots – We do not see that we do not see. "Shaping Media" can be read both as active and passive, as "the medium that shapes" or "the medium that is to be shaped". This seminar will use the notion of medium as an artificial, but hardly visible conceptual space, formed by personal expectations, cultural conventions and technical restrictions. A medium is a "possibility space" (Will Wright / Niklas Luhmann) which can be created or be used for creation, to foster e.g. learning. Pedagogic Media Theory is an approach to include cultural, media historical, and educational aspects for understanding existing and developing new medial environments for teaching (sic) and learning.